Some of you might laugh at the idea of finding the best “cheap” elliptical machines, but I promise I’m not joking around here. It is possible to find budget ellipticals that are actually worth buying. The trick is knowing what to look for and where to look for it. Luckily for you, I’ve already done the heavy lifting for ya on this one. I’m going to present to you my favorite home ellipticals that won’t break the bank, but will still provide a solid workout experience. But we have to set some rules first. Like, what counts as “cheap”? My definition and your definition might be a little different. To make sure we are all on the same page, for the sake of this article, cheap will be defined as any elliptical under $300. Jump ahead: ProForm 295 CSE Elliptical – Best Overall! And that’s ok, as long as you know what you’re getting into. As long as you aren’t expecting your $300 elliptical to feel like the $6000 elliptical you used last week at Gold’s you should be ok. You have to have realistic expectations when it comes to cheaper equipment, just the way it is. And I say this because I see it all the time when reading user reviews. So and so is disappointed because their $200 elliptical or $129 treadmill “feels different” than the one at the local gym. Come on people! Let’s get real. Knowing what to expect makes all the difference in the world. Now I’m not saying all cheap ellipticals are the same. No, not at all. They will all share certain qualities, but some (i.e., the ones listed in this article) are heads and shoulders above the rest. These are the ones you can feel more confident in buying… as long as you know what to expect. 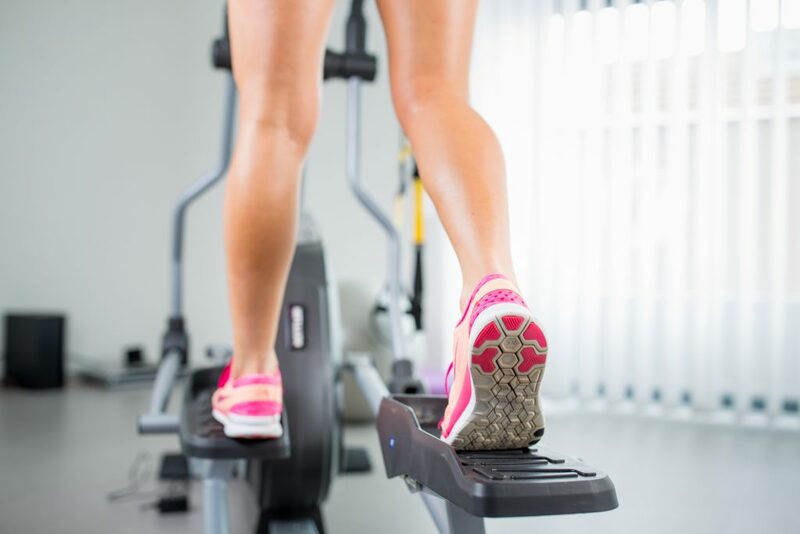 Stride length is arguably the most important feature for an elliptical when it comes to comfort. The stride length is how far apart your legs move front to back during use. This is what gives an elliptical its “feel”. Stride lengths vary greatly from model to model, but one thing is for sure- cheap ellipticals have shorter stride lengths. Quality moderately priced and higher-end ellipticals usually have a stride length of 20 inches. This is the gold standard for home ellipticals because it can comfortably fit most users. Ellipticals under $300 have stride lengths in the 11-14 inch range. This is significantly smaller. With a stride length of 14 in, most average height users are going to feel like they are jogging in place during use. Don’t expect to be able to stretch you legs out fully like you can at the gym- these budget ellipticals simply aren’t big enough. If you are shorter, say between 5′ or under, you might feel pretty comfortable with such a small stride length though. Weight capacities on budget ellipticals will also be lower. I’m a fan of always comparing weight capacities between machines because it gives us a great indication of how well-built they are. Higher is always a plus in my book. Higher-end home ellipticals will have weight capacities in the 300 – 400 lb range. This is great and will safely fit almost any user. Cheaper ellipticals will have weight capacities in the 225 – 250 lb range. Sorry big guys, if you are over 250 lb you’re gonna have a hard time finding an elliptical under 300 bucks. You’ll notice a big difference in the warranties offered on budget ellipticals too. Some ellipticals in this price range will have no warranty, I’d stay away from those. In this price range, you should expect warranties anywhere from 90-days to 2- years. They are usually separated into parts and labor warranties. For comparison’s sake, more expensive ellipticals come with lifetime frame warranties and parts/labor warranties in the 2-5 year range. Some better, some worse. That said, there are a few exceptions to the rule. That about does it. I hope I haven’t smashed your hopes and dreams too much. Although cheap ellipticals can’t stand toe to toe with the high-end stuff, it doesn’t mean they don’t have value. You can get a decent workout on the right budget machine. And remember why we are looking for cheap ellipticals in the first place… because they are cheap! These prices are amazing. The fact that we can buy an ELLIPTICAL for our home (that actually works) for under $300 is pretty incredible these days. But just in case I scared you away from the budget deals below- if you are interested in learning more about some higher-end home ellipticals, you should check out my elliptical buyer’s guide. The ProForm 295 CSE Elliptical gets my vote for the best overall budget elliptical because it simply has more to offer than the competition. This elliptical offers a couple of features you wouldn’t normally expect to see on a machine in this price range, such as built-in speakers and the ability to pair with iFit, the fitness app membership. The Proform 295 CSE comes equipped with a 14″ stride length. We know this is small, but we are expecting small. 14 inches is as good as it gets for under $300. This elliptical has a weight capacity of 250 lb. Again, this is at the top of the expected weight limits for this price range. This will be enough to accommodate a lot of users, but keep in mind these ellipticals are better suited for smaller folks. ProForm has included a 90-day parts and labor warranty on the 295 CSE. This is on the lower end of the scale and I would like to see at least a year, but nothings perfect I guess. Overall, the ProForm 295 CSE is hard to beat. It’s the most high-tech elliptical in the price range with an impressive selection of workouts and resistance levels. I wish the warranty was a little better, but for under $300, this is still a smart buy. Click below to learn more and see what users are saying. The Exerpeutic GOLD 2000XLST is another cheap elliptical trainer that offers more than most other comparably priced machines. This elliptical has an impressive weight capacity and an equally impressive collection of built-in workouts. If you are looking for a cheap elliptical with bluetooth capabilities, this might be the one you’ve been looking for. The Exerpeutic GOLD 2000XLST has a 13″ stride length. This is a full inch smaller than the Proform 295 CSE. If this elliptical had a 14″ stride length, it might have made my number one pick. But an inch can make a big difference when we are talking about such small stride lengths to begin with. This elliptical has a max weight capacity of 275 lb. This is quite impressive for the price range. This is pretty close to the 300 lb limit I like to look for. With a 275 lb weight limit, it will be safe to use for larger individuals, just keep in mind that stride length is still only 13″. Exerpeutic includes a 1-year limited warranty on the 2000XLST elliptical. This is pretty solid for a budget elliptical and blows away the 90-day warranty offered by Proform above. Overall, the Exerpeutic GOLD 2000XLST Elliptical Trainer is a good combination of function and features. It has a respectable weight capacity and a decent warranty for the price range. It really gives the Proform a run for it’s money, but I think the extra inch in stride length is important. The biggest complaint users have has to do with assembly, some find it difficult (or it arrives missing parts, which I guess would make things a little difficult). The Simpfree Elliptical Machine is a no thrills, simple to use machine that made the list because it’s easy to put together and runs smoothly. Unfortunately, in this price range, this shouldn’t be taken for granted. The Simpfree elliptical is priced a little lower than the 2 previous ellipticals, so if you aren’t interested in some of the extra features, you could save yourself a little cash and try this one. The Simpfree also has a 13″ stride length. As a 6’1″ male, I would look for as long a stride length as possible. But for shorter individuals, the smaller stride length might work fine. This elliptical trainer comes with a 250 lb max weight capacity. Not as high as the Exerpeutic GOLD, but still respectable for the price range. These weight capacities are also impressive considering how small these machines are- this elliptical has a footprint slightly under 2′ x 1′! Simpfree offers a 30-day money back guarantee on their elliptical trainer. Thats a nice safety net that gives you a chance to try it out for a few weeks to see how you like it. They also offer a 1-year warranty on the machine. I’m a fan of the money back guarantee. The Simpfree elliptical trainer is applauded by users for how quiet it is. It’s also tiny, so if space is an issue, this could be the right elliptical for ya. This elliptical is missing some of the more advanced features like bluetooth and speakers, but it’s a little cheaper and is very highly rated by users. If you are looking for a quiet, easy to use elliptical this is a smart choice. The EFITMENT E006 Magnetic Elliptical Machine is very comparable to the Simpfree elliptical in price and stats. This is another bare-bones elliptical trainer that is designed for smaller users who aren’t interested in a ton of workout programs or tracking fitness stats through apps. This EFITMENT elliptical also has a 13″ stride length. The 14″ stride length on the Proform is starting to look like a real hidden gem now isn’t it? Well, truth is, we just don’t see many 14″ (or higher) stride lengths for under $300. Just think, a lot of cheap ellipticals are even smaller at 11″. The weight capacity on this machine is the lowest of the bunch so far at 220 lb. This is actually more representative of what most of the cheaper ellipticals can offer. Between the 13″ stride length and 220 lb weight capacity, this elliptical is really designed with smaller users in mind. The saving grace for the EFITMENT E006 is the generous, 3-year warranty offered by the manufacturer. This is by far the best warranty we’ve seen so far. 3 years is a long warranty for any piece of fitness equipment in this budget price range. Overall, the EFITMENT E006 Magnetic Elliptical Trainer is a small, easy to use machine that is best suited for smaller individuals. It’s very comparable to the Simpfree elliptical machine discussed above, but this one has a lower weight capacity. For me, the most impressive stat here is the warranty. Otherwise, there’s really no reason to choose this one over the Simpfree. Body Champ Magnetic Elliptical Machine – Cheapest! Rounding out the top 5 is the Body Champ Magnetic Elliptical Machine. “Body Champ”…great name. Anyway, I think this elliptical is a real deal because it is the cheapest machine on this list by far and actually offers more features than the 2 previous ellipticals. This elliptical is currently priced well under $200 and has more features than it should. I had a hard time finding the exact stride length for this machine. Often when a stride length is really small, manufacturers won’t exactly advertise what it is. According to Body Champ, the stride length is “about 14 in“… Take that as you will, but to me that sounds a lot like 13 in. Again, small but to be expected from machines in this price range. The Body Champ elliptical has a max weight capacity of 250 lb. This is very respectable considering this machine only weighs about 60 lb. Most of the ellipticals already mentioned weigh somewhere between 80 – 100 lb. This is a light machine that can handle a pretty good load. This elliptical comes with a 1-year limited warranty. At this price, I’m honestly surprised it comes with any warranty at all. But 1 year is great for a machine this cheap. That should give you a little piece of mind if you decide to purchase. Overall, the Body Champ Magnetic Elliptical Machine has a ton to offer at a pretty ridiculous price. We’re talking built-in workout programs, a heart rate monitor, and a workout DVD thrown in for good measure…and all for under $200. In all seriousness, this elliptical has a respectable weight capacity and a decent warranty as well. This is a good bet if you are looking for a budget elliptical with a few more features to play with. The key to finding a cheap elliptical you can be happy with is having realistic expectations. If you know what to expect from machines in this price range, you are less likely to be disappointed with what you get. You have to realize that ellipticals that cost under $300 are going to feel different than machines that cost $1000. That said, there are definitely ellipticals in this price range that stand out from the rest. The 5 ellipticals you’ve just learned about are those ellipticals. These are the best cheap ellipticals currently on the market because of their stride lengths, weight capacities, and features. The Proform 295 CSE is my number 1 pick because it has the longest stride length of the bunch at 14 in. All of the other ellipticals are at 13 in. You might not think 1 in is a big difference, but in this league every inch counts. The Body Champ elliptical is another stand out machine because of how much it has to offer at such a low price. This elliptical is almost $100 cheaper than any other model listed. Great buy. I hope this article was helpful. If you have any questions or comments please leave them below and I’ll get back to you soon. If there are any cheap ellipticals you have used and you think should’ve made the list, please tell me!